Of all the things that have happened to me, nothing has been as dreadful as this day — in a good way, of course. I’ve come home with dreadlocks. I liked my long hair, but I was tired of the daily maintenance, even though I gave up using shampoo over two years ago. I found that while we were travelling through Queensland last month, the daily brushing was neglected, and I became comfortable with a different, more casual level of hairstyling. 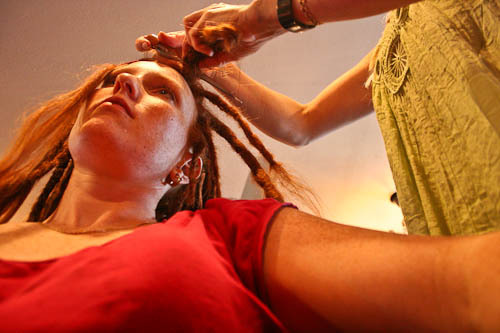 After dreaming about it for months — I was first inspired at this year’s unschooling retreat — I found a hairdresser who could twist my hair into dreadlocks. And today was my first dreadful day. Before I left for the day, I kissed David good-bye. My hair reached down to my waist. I brought 5yo Aisha along with me — she was the official photographer for the day! Kacey started by sectioning my hair. She started backcombing one section of hair. The hair started knotting up. 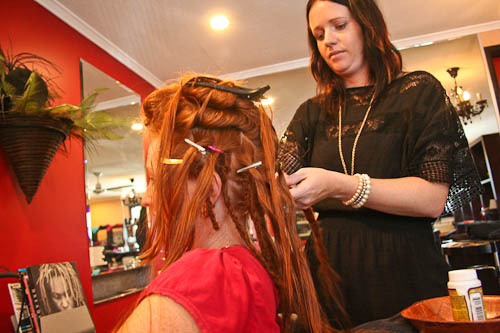 Kim focused on finishing the dreads by rolling them in her palms and tightening the ends with a crochet hook. 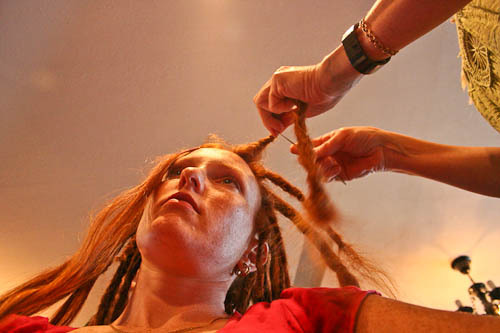 A special tool was used to allow the end of the dreads to be twisted up and back through the middle of the dread close to the hairs' roots. 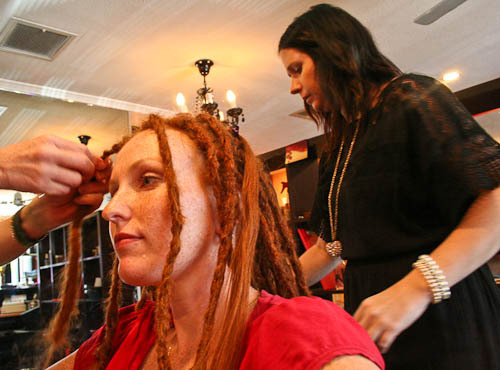 It didn't take long for the first couple of dreads to be finished. Slowly, the rest of my hair was sectioned in preparation for more dreadlocks. 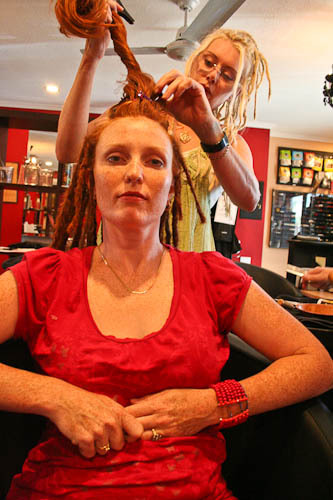 Crocheting the dreads twists the stray hairs in and out of the lock, tightening it and binding it all together. The whole procedure took Kim and Kacey three hours, which was a lot quicker than I was anticipating. 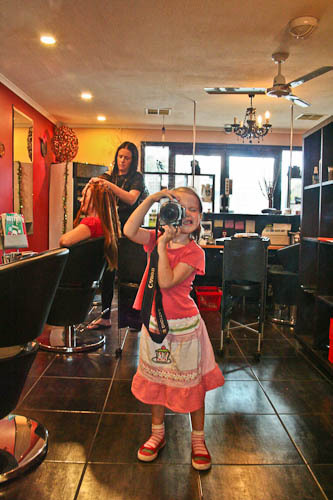 When she wasn't photographing the action, Aisha wandered around the salon taking random photos. At times, the pulling was quite painful. I also had to suppress the urge to protect my hair from being broken. 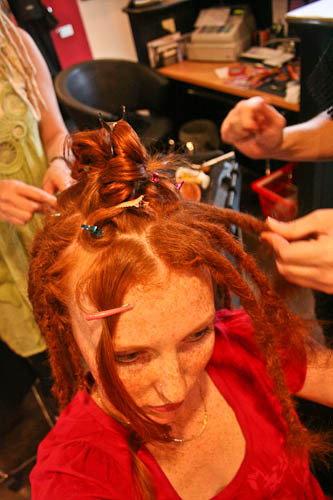 Even though at this stage the dreadlocks were halfway done, most of the ends still had to be finished and and the locks tightened with the crochet hook. Here you can see the end of the dread being threaded through the top of the lock to secure the roots. 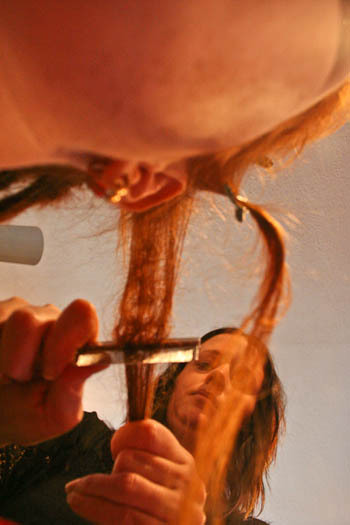 When the hair is knotted together in locks, quite a bit of length is lost. 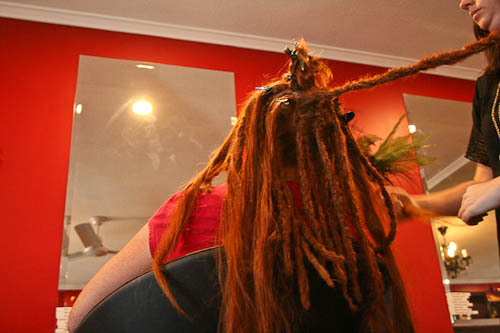 I lost about a foot of length at the back by the time the dreads were completed. Aisha did a great job of taking the photos! 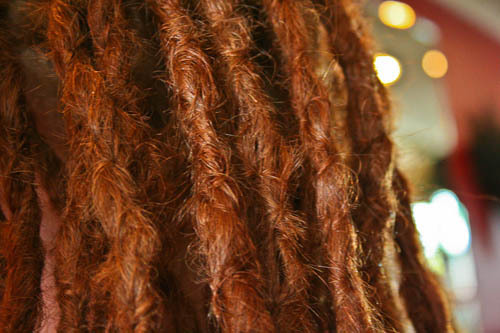 A close-up picture of my new, knotty hair. 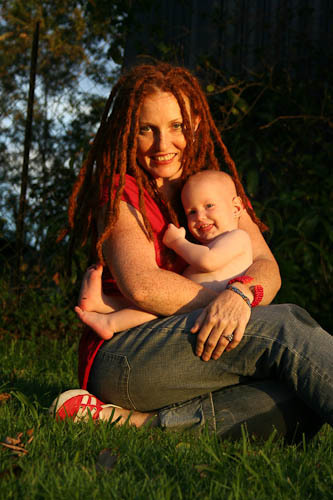 When I got home, Delaney was delighted with my dreads and started eagerly pulling on them. I love the way I can just tie my hair back with my long locks. 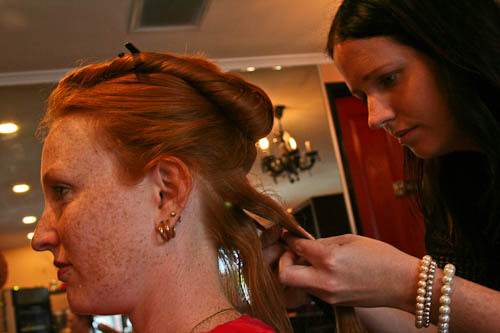 Almost any sort of knot will hold the hair in place. I'm starting to get used to the mop-haired feeling. Dreadlocks mean a lot more to me than just a simplified hair routine. 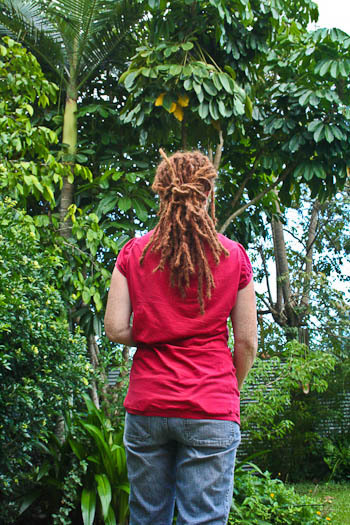 But this post is just about the procedure — I’ll have to explain the whole philosophy behind embracing dreadlocks another time. In the meantime, I’m having a good time with my new hair! One disadvantage of dreadlocks is that they increase your head size. I had to try on all our hats to find which ones fit — this one of David's does. I’ve been warned that it takes several years for dreadlocks to really “come into their own”, and in order to maintain these dreads, I’ll need to keep rolling them with my palms. 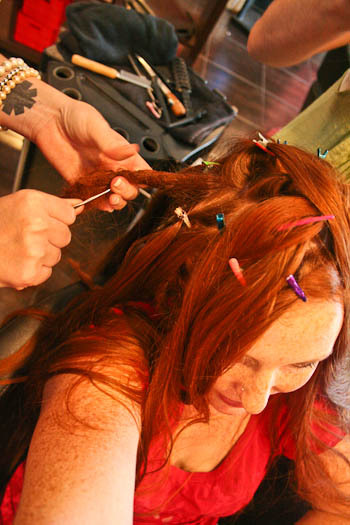 If I don’t do this, the loose hairs will lock together — with other dreads — and the back of my head will merge into one big matted mess. They look great, Lauren, just how I imagined! You don’t need the scarf/headband either! Are they heavy? They’re not heavy, but it feels like I’m wearing a wig or something because they feel so foreign. Oh my – they’re kinda cute! Great job on the photography, Aisha! 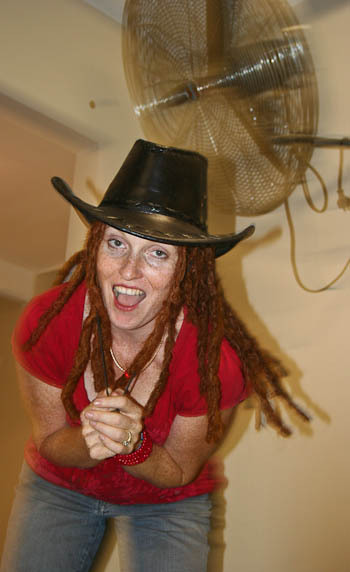 Now that you’ve had your hair put into dreads you should face the epilator again. The whole procedure looked very painful and took much longer than it would take to epilady your other leg. 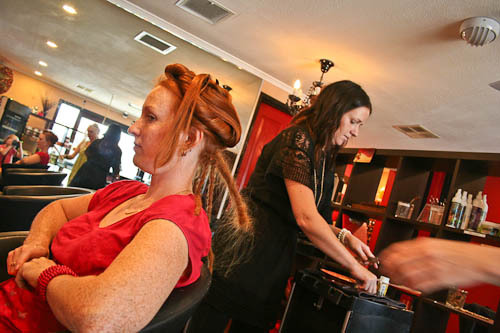 Have you heard the story about the person who had a redback spider in his dreads? I guess it was because he didn’t maintain his hair properly. What does David think of your new ‘do? David really likes the hair! And the epilator — yes, perhaps I am brave enough now! I feel like I’m a new woman! ROAR! 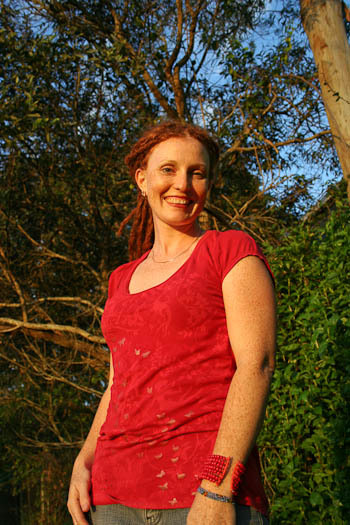 Wow, Lauren, love, love, LOVE the dreads!! I’ve been half considering getting mine done for awhile now. I don’t have anywhere near the length you did, though, and I’m not sure they’d look good too short. Will keep considering. My hubby wasn’t too excited about the idea. :( I’m keen to hear more of your philosophy behind why you got them! Awesome! They look awesome! I have considered it but I am constantly changing my hairstyle, plus issues with allergic reactions making my head incredibly itchy. I can only tolerate braided dreads for about 4 days before I start getting headaches and itching like crazy. So I guess dreads are not for me despite my longing for them. Can’t wait to read about your philosophy behind them. Do you plan on keeping them for years? They look really good on you, and I’m sure it will simplify life. 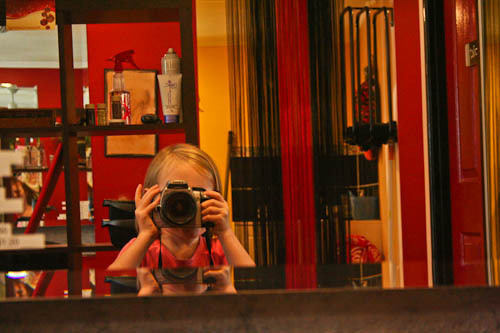 Enjoy your new “do”! Lauren love – I think you look just smashing, really funky, the height of cool. Are you really mine? I’m looking forward to being seen with you. 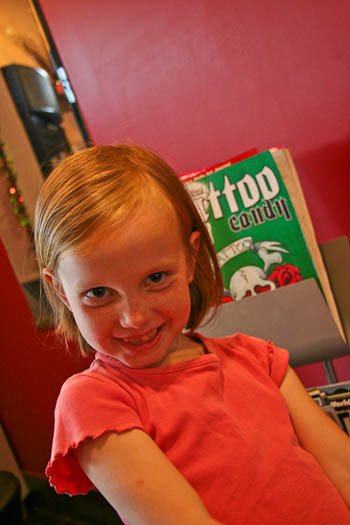 And you are so photogenic – Just give me that camera! Your husbands comments are absolutely the BEST! I love the new hair, it so suits you! I love them tied back! Can’t wait for the philosophy post! your so brave! iv been wanting to do this for more than ten years and always have an excuse!! you look fantastic and REAL!! thank you for showing us how you can really live if you really want to. I will be the ONLY one it seems, to say……your hair before dreads was really beautiful I just loved it! Alas, it is just hair and doesn’t make you or unmake you. 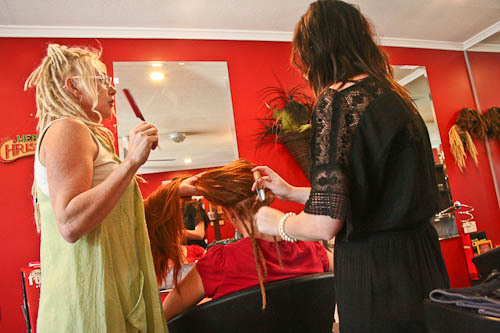 Dear Katherine – Having a hair style like Lauren’s new one has a very profound effect on the way people look at you, the comments they make and the judgments that they make about you. It takes a special kind of person with a special kind of confidence to embrace this kind of attention. For Lauren to experience a new kind of interaction with people is formative (and liberating) – Due to the new way in which Lauren will learn to relate to people my opinion is that this hair style will contribute to who Lauren is becoming. 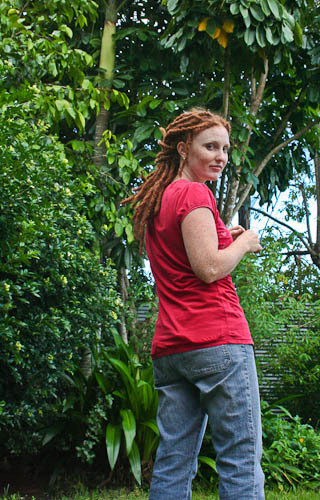 Ok, it’s confession time: I’ve been toying with the idea of dreadlocks myself for the past several months or so. I had planned to do them myself by doing two strand twists and allowing them to dread by re-twisting/palm-rolling on a regular basis. Well, I had them twisted for the last three weeks, but then chickened out just today and undid them all! Ugghh! How your post today convicted me, encouraged me, and moved me! I may find the courage to take the leap myself soon. Oh, and you do look absolutely stunning! wow!!! !Lauren, love it soooooooooooooooooooooooo much!!!! it suits your face very very very much!!!! and ur personality as well being a kinda hippy style. well done! really suits you, but you gotta give us some more pics with more poses! and now comes the wardrobe change to keep up with the new style you are finding! love it! Wow – you look great! Who’d have thought you could wear that! Perfect for you! Beautiful. Funky. Free.